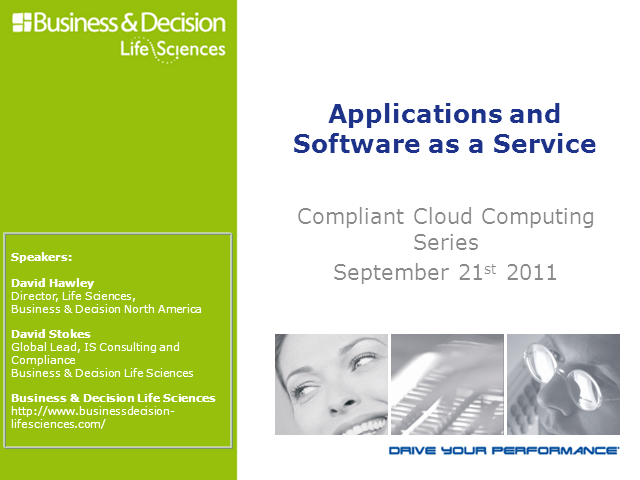 In the third of three webcasts looking at the compliant use of Cloud Computing, specialists from Business & Decision’s Life Sciences and SAS Institute look at what it takes to deliver and support complaint “Software as a Service” (SaaS) models for both Private and Public Cloud models. In order to achieve success in a market of empowered consumers, organizations need to provide personalized customer experiences. New digital interaction channels are not only changing the way we engage with our customers, but are changing their expectations. In this live webcast presented by Lee Cavallo (Certified Adobe Campaign Business Practitioner) and Mehdi Berrahou (Certified Adobe Campaign Developer), learn how marketing automation platforms are streamlining these engagements, and how B&D is leveraging its skillset to take it one step further. 1.Learn about the importance of the customer’s digital experience, and what is required for organizations to foster successful relationships out of these engagements. 2.Learn about marketing automation platforms, such as Adobe Campaign, and its ability to solve the marketing challenges of today. 3.Learn about B&D’s relationship with Adobe Campaign, and how together, we provide game changing ROI for the marketing end-user. At the heart of every business is its customer. Yet how many businesses truly align their entire organization around the customer and the customer’s experience with their business? Join us for our Digital Business Transformation Workshop as our experts walk through the first steps of a Digital Transformation and layout a simple frame work that you can apply to design your businesses Digital Transformation road-map. 3.Case Study: See a firsthand example of a Health Insurance Company’s Digital Business Transformation and how they began their process. In today’s fast changing IT support environments companies are looking to find ways to reduce cost while, increasing quality of service which are often opposing forces. By understanding IT support metrics, companies can better position themselves to measure success and turn opposition into opportunity. Join us on Wednesday, July 29th at 2pm EDT and learn about metrics that can help measure your IT support environment’s health, reduce costs and improve your IT support services. Join us for a complimentary webinar and discover how you can transform your company’s Customer Experience effectiveness. Learn from the experts! Join us on Wednesday, May 27th at 3pm EDT and discover how you can Digitally Transform your Customer Experience effectiveness with the latest strategies, tools, and applications to leverage the return on investment through return on information. Lync 2013 (soon to be Skype for Business) is commonly known as an instant messaging client that includes voice and video capabilities within the enterprise. However, its ability to cross enterprise network boundaries and reach colleagues, partners, and customers across the globe via mobile phones or traditional telephony systems is often overlooked. The natural progression in collaboration may start with a quick instant messaging conversation but often leads to picking up the phone and calling someone to attain resolution. Join us on Wednesday, March 25th at 2pm EST to learn about the capabilities of Lync Enterprise Voice, ways to implement it as a cost savings to your business, the impact of the launch of Skype for business and how the progression of enterprise voice collaborative tools are changing the way we run our businesses today. oin us for this featured webcast and learn the Internet of Things is changing the way we leverage our ERP solutions to access Meaningful and Accurate data, measure and track results, help you stay ahead of the competition and take your business to the next level. Join our webcast on January 28, and discover how to get your ERP Solution ready for prime time in 2015 by employing new trends in Internet of Things Solutions for your business! According to researchers, more mobile devices than desktop computers will be used to access the web by 2015. SharePoint 2013 offers several options to optimize public-facing websites for mobile devices. Which one you choose depends on the different factors that apply to your scenario. SharePoint 2013 device channels and responsive web design are similar approaches, but their capabilities differ and they have different impact when used for optimizing a website for mobile devices. Join us to learn about the advantages and disadvantages of Responsive Design vs. SharePoint 2013 device channels and how to choose the right method for your organization. In part 4 of our Compliance Fundamentals series, Guy Wakefield discusses the fundamentals of change and configuration management, focusing on key concepts and examples for the IT personnel that support them. Analytics 3.0 breaks through constraints that companies have faced around enabling any analytics, on any data, at any time. For many companies, the scope of data analysis has expanded from gathering operational business intelligence to performing product offering analysis using embedded data intelligence. Join our live webcast on May 15, 2014 at 12 PM EST and learn how analytics has evolved from business intelligence to the new era of data-enriched offerings, and how you can apply Analytics 3.0 to produce measurable business benefits and optimize internal decision processes for your organization. Join us to learn how Office 365 archiving can help you to meet all of your archiving and eDiscovery needs. •What are Exchange Online archives? •What are the limitations of Exchange Online archives? •How does eDiscovery work with Exchange Online archives? •What do I need to consider before migrating from a traditional archive to Exchange Online archives? EXALEAD OnePart is an innovative application for locating and reusing 2D/3D legacy parts, designs, and associated documentation. The intuitive user experience allows designers, engineers, and R&D managers to shorten product development times, improve efficiencies, and lower lifecycle costs. OnePart provides cross-product meta-data, shape search, discovery, and visualization, with side-by-side compare of information about a design, part, or component for rapid and thorough investigations of reusable enterprise assets. OnePart is NOT an application inside the PLM system, but is a search based solution that can feed the PLM (or any system of record) with newly found IP. OnePart is browser-based and works without plugins, meaning no install on user machines and very efficient for new version rollouts. Recap of "Who Needs to Be Compliant" and "SOX Compliance Fundamentals" with live Q&A session. Life Sciences: Who Needs to Be Compliant? In this on-demand video, Ashley Peacock, Director of Regulatory Compliance with Business & Decision, presents an overview of the Sarbanes-Oxley Act and discusses how SOX impacts IT organizations and how companies that are subject to other regulations can implement SOX compliance as part of a multi-regulation quality system. Design Manager is a new tool in SharePoint 2013 that was built to give users an easier way to brand your internal intranet site or public-facing website. Join us on March 13 at 12pm EDT to learn how you can leverage the skills you already have to easily create pixel-perfect branding for your SharePoint environment. If your business is like most, the organizational systems you use have evolved over time, creating a complicated technology landscape. Disconnected systems and information silos result in inefficiencies, costly maintenance requirements, and ultimately—missed opportunities. Join our live webcast and learn how to simplify integrations and upgrades, reduce the burden on IT, and give end users the flexibility to adapt business processes as needed. John Dempster, Matt Stratton, Bob Dawes, and Ellen Derrico, Global Head of Life Sciences and Healthcare Market Development at QlikView, will walk you through client case studies and discuss ways that Life Sciences and Healthcare companies can apply similar solutions to improve sales operations. Engineers and designers are confronted with an information challenge: the search for existing parts, CAD files, data and related information takes too much time. Instead of finding a part to reuse, it’s become faster to create a new part, costing the organization needles time and money. View this video to learn how to reveal hidden assets, reuse legacy parts and reduce duplicate parts with EXALEAD OnePart. Many companies in Healthcare and the Life Sciences implemented quality systems in their IT departments to meet the requirements of the FDA and EMEA, only to find out a few years later that they also needed systems to manage compliance required by the Sarbanes-Oxley Act (SOX). Now they have two quality systems, making it difficult for IT personnel to know which to use, and often causing redundant work. This webcast will give an overview of how to leverage your existing FDA quality systems to meet SOX requirements and discuss where existing quality systems need to be augmented to also meet the requirements of SOX. The Topline is a series of live webcasts discussing ways to solve current business challenges through technology from Business & Decision, a global leader in Business Intelligence (BI), Customer Relationship Management (CRM), e-Business, Enterprise Information Management (EIM), Enterprise Resource Planning (ERP), enterprise solutions, management consulting and managed services & hosting. The Topline frequently features webcasts with topics specific to the Life Sciences industry as well topics that are relevant to all industries.